Whether it's a family holIday to a tropical paradise or an exciting camping trip to the countryside, our love for travel is often linked to our desire to experience the healing touch of nature. Sadly, climate change and human-induced pollution threaten to alter our environment forever. With 12 million tonnes of plastic waste entering our ocean each year, scientists speak forebodingly of a doomsday when there will be more plastic than fish in our ocean. Thankfully, a selection of institutions are taking positive steps to clean up, with recent efforts from Marriott Hotels replacing plastic-wrapped soaps and shampoo bottles with shower-product dispenser systems - with the promise of other hotels following suit. Browse our selection of glorious green hotels and be inspired for your 2018 holidays - find out more about how to stay green when travelling with our handy beginners guide to ecotourism. The beautiful lake of Titreyengol in Turkey is home to the eco-friendly resort of Otium Eco Club. Winner of numerous awards, this resort is the perfect place to be at one with nature, without compromising on comfort and convenience. The hotel actively participates in various WWF campaigns, involves school students to plant trees in the surrounding areas and donates food to the local animal shelter. Otium Eco Club also believes in the mantra of ‘go local’, with everything from the food served to the guests, to the materials used in the rooms, being locally sourced. As part of a sustainable tourism programme, this green hotel has saved electricity consumption to a great extent and reduced 5670kg of Co2 emissions. The sun-dappled shores of Costa Rica are known for their bio-diverse parklands, shimmery beaches and world-class hotels. However, a few of them are taking their commitment to environmental sustainability quite seriously. Hotel Punta Islita is a luxury establishment, and has won numerous awards for its sustainability-focussed practices. Describing its approach as “planet-friendly, people-positive”, the hotel is involved in wildlife conservation, reforestation and local employment opportunities. While its Ara Project has reintroduced rare specimens of red-and-green macaws, its aggressive conservation practices have saved the endangered sea turtles from extinction. Art and education are the twin pillars of community development for the hotel. The local art museum doubles up as a training centre for local artists, while the Islita Creative Centre provides critical education, along with art training and nutrition guidance to underprivileged children. True to the boastful claims on its website, Milia Mountain Retreat (situated in a 17th century Cretan village) reintroduces the concept of ‘back to nature’ travel. The hotel itself is a refurbished, eco-friendly, stone structure that oozes bucolic charm and rustic simplicity - a real away-from-it-all establishment. Solar powered panels heat water, wood-burning stoves are still used to heat the guest cottages, and the restaurant of the hotel only serves locally sourced, organic food and hand-crafted wine. The hotel emphasises tourist activities involving two of the most important resources of the local economy - natural springs and chestnut trees. Nature walking, hiking and yoga sessions not only keep guests fit, they also improve awareness about the gorgeous flora and fauna of the region. The words "Las Vegas" do not exactly conjure up images of eco-friendly hotels (we're looking at you Circus Circus), but the Palazzo hotel has been somewhat of a green crusader in a quest to save the environment. The entire hotel is lit by special LED bulbs designed in partnership with General Electric. It's also the home to the largest rooftop solar panel in the United States, and an equally nano-filtration system that recycles water for cleaning purposes. Apart from environmental consciousness, the hotel is also known for dazzling its guests with glamour and hospitality - as you'd expect when visiting this famous metropolis! Beyond its pretty beaches, redwood forests and exotic vineyards, California is often known for being the torchbearer in environmental sustainability. Its green hotels enjoy third-party certifications and proudly display their environment-friendly practices on their websites. One such eco-hotel in California is H2 Hotel, which employs a variety of methods to conserve the environment – from using solar panels for heating and electricity to reducing waste reduction through recycling and composting. The hotel’s menu is carefully crafted by using locally sourced produce, while all the bath amenities are natural and refillable. The hotel, however, combines environmental concern with luxury as well. Inspired by the agrarian sensibility of the local Healdsburg region, the spa of the hotel features a range of decadent treatments from products sourced from the state’s farms. From intoxicating wine-and-honey wraps to aromatic Meyer lemon and sage massages, spa treatments have never been so eco-chic! The beautiful island nation of Maldives is under serious threat from global warming, beset by rising sea levels and bleaching of its once rainbow-coloured coral reefs. However, a few of the resort's hotels are taking baby steps to save the country from the perils of environmental degradation. 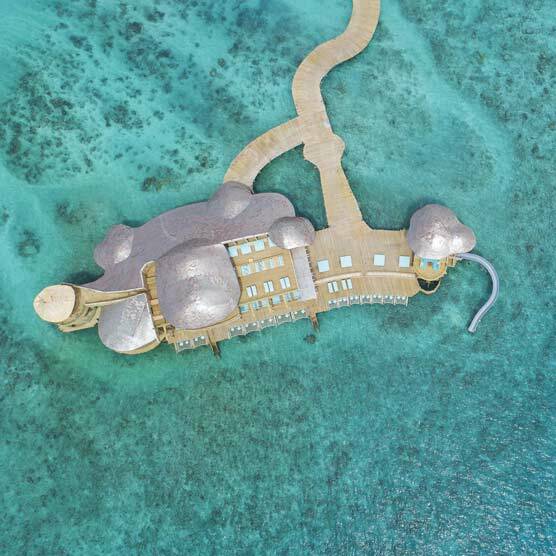 Soneva Fushi ranks high in the list of the best green hotels in the Maldives, located in the stunning Baa Atoll, the hotel boasts nature-inspired architecture, one of the largest solar power plants in the country, and leisure experiences that effortlessly combine nature with luxury. Be it a picnic to a deserted island or a guided snorkelling session with a marine biologist, the hotel ensures being environmentally conscious is the key to a fun-filled holiday experience. The hotel also maintains two grand nature reserves - where turtles can lay eggs in peace - plus a glass studio, where master craftsmen turn shards of glass waste into exquisite works of art.